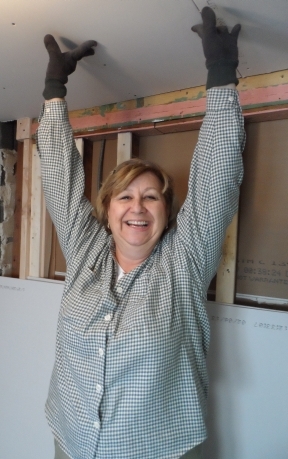 Of all the Superstorm Sandy-damaged properties being repaired during this year’s Millard Fuller Legacy Build, none is located closer to the beach than that of homeowner partner Louise Gordon. 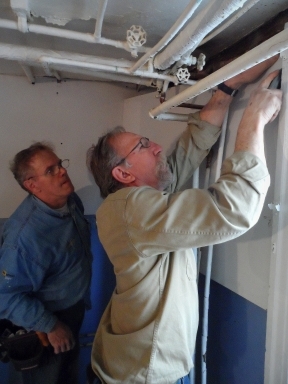 Because of its age and proximity to Atlantic City’s beach, it may be the property that needed the most work, and that’s why veteran house leaders Charlie Thell and Tim DuBois of Minnesota are on the job. They knew they would need a well-organized crew of volunteers to get the job done. They got it in the form of 11 members from Hancock United Church of Christ of Lexington, Mass. While many of the work crews at Legacy Build house projects are an assembly of volunteers from different parts of the country with varying skill sets, “Team Hancock” came pre-assembled. DuBois is a Legacy Build veteran, and he said that was key to getting off to a quick start on a property that needed so much work. “Working with a unit, they don’t have that first day, find out what everybody’s limits are and personalities are,” he said. “They’ve got that basic rapport already established, so we save a day of that kind of stuff. Just about every one of them has done this kind of project as a group, so they came into this knowing in some cases what their roles were as opposed to the crew leader taking a dozen people that are not affiliated and determining that. That was predetermined. In this case, that was invaluable. Not only did “Team Hancock” come with a solid corps of experienced volunteers, but they also are helping to raise money for the repairs. They just recently launched a fundraising page through which they have raised more than $1,700 toward their $30,000 goal. “We’re passionate about housing all over the world, and we’ve got a great group of people who decided to come here and help,” said Robin Digiammarino, who helped lead the fundraising effort along with Cheryl Kraley. Her husband, Mike Kraley, said that while the team may come more pre-assembled than most volunteer teams, it is never the exact same group of people. But whatever the mix, he said it is a great way to get to know his fellow church members even better. The team working on Gordon’s home wasn’t composed entirely of Team Hancock members. They had some pretty high-profile infiltrators—including Fuller Center co-founder Linda Fuller Degelmann and her husband, Paul Degelmann. Also working on the house Tuesday was veteran volunteer Georgia Solotoff, who was able to drive down to the build from her home in northern New Jersey. But for Solotoff—just as it is for DuBois, Team Hancock and the more than 200 other volunteers who have converged upon Atlantic City this week — working alongside homeowners in need is about much more than getting together with old or new friends. Speaking of checks, Solotoff got Tuesday’s work off to a great start at morning devotions when she presented a $4,000 check to The Fuller Center for Housing in the New Jersey Pines, hosts of the 2013 Millard Fuller Legacy Build. The money came from her local Rotary Club’s District 7470. She said they had been looking to contribute to a Sandy relief project and were excited to contribute to The Fuller Center’s work. Contribute to Team Hancock’s fundraising page for the Legacy Build by clicking here! See pictures from the Legacy Build on The Fuller Center’s Facebook page.